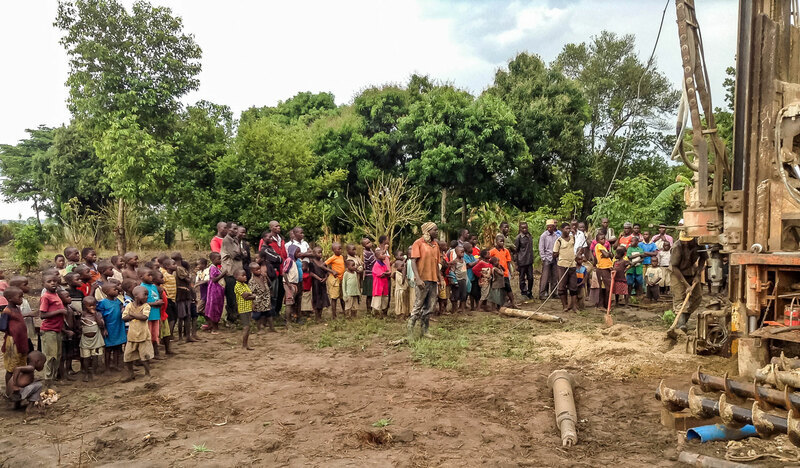 A water technician’s arrival at a village is a moment of absolute elation in rural Uganda. When Lifewater Ugandan Jr. WASH Technician Charles Emugu stepped foot onto Bukumbi village in Kaliro, Uganda, he experienced their excitement. Drum beats filled the warm air. Women, men, and children alike sung and danced. Many elders stood in the crowd, an open-mouthed smile on their faces and tears in their eyes. 75-year-old Menya Balonda Patrick was one of these elders. “This is the happiest day of my life! I never thought I could be this happy. I had given up hope of living long enough to witness this day,” he said. Bukumbi village used to get their water from a well over five kilometers (3 miles) away. After they arrived on foot at the overcrowded well, they would wait an average of an hour and a half to three hours in line. Most days, they could not get enough water to drink or do their daily chores. When Bukumbi village first learned about the opportunity of receiving their own well, they were skeptical. Was this organization really going to drill a well for us? Nevertheless, they became motivated by the opportunity. Together, they met every requirement, practicing five healthy habits in each household. Today, Bukumbi has 74 healthy homes; that’s 99% of the village. They built their own, safe restrooms, ended open defecation, and became a Lifewater certified Healthy Village. They contributed labor, materials, and resources toward the water point construction, forming a water committee to collect enough user fees to save for future repairs. 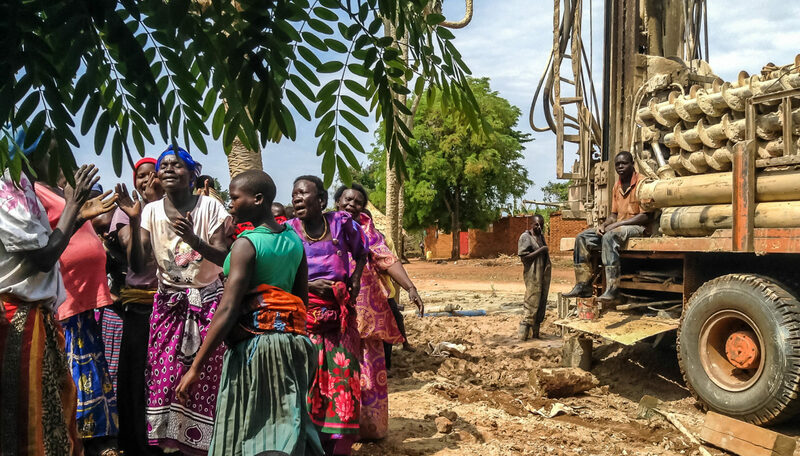 The village watches as Emugu and the team begin to drill their well. And when the technician arrived, they rejoiced. Lifewater staff member Richard Arran was there to witness it. “Being one of the most water stressed areas in Kaliro district, the Bukumbi residents could not contain their joy upon realizing that water was finally coming closer to their village,” he said. 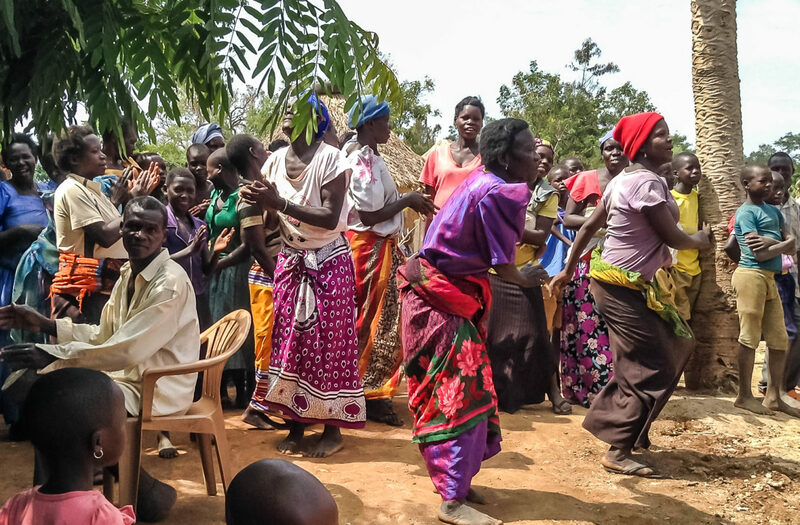 The community rejoices at the construction of their water point. Richard explained that in rural Uganda, gifting someone a chicken is a sign of gratitude. It’s a mark of appreciation, and many Ugandans keep chickens to give as gifts or to sell when they need some more income. “I would like to take this opportunity to thank Lifewater International for bringing life to Bukumbi village. I say ‘life’ because water is life,” Balonda said. He then handed Lifewater Jr. WASH Technician, Charles Emugu, one of his chickens and continued celebrating with his dancing village. By the grace of God and the faithful support of Lifewater donors, 77 rural villages in the Kaliro, Uganda region have experienced the life-saving impact of clean water and improved health. Today, communites in Cambodia, Ethiopia, and Uganda are celebrating the arrival of Lifewater water techinicians, and to date, 321 villages have danced, sang, and praised God for clean water. Water point number updated Aug. 10, 2018.